Elder Scrolls Online rewards dedicated crafters. The main problem with crafting in most MMOs is that you can often only learn a small number of professions on a single character. To me that is just an artificial way to force players to create crafting alts. Why would you not be able to craft everything on the same character? That said, further down this article you’ll find exactly why crafting “everything” on the same character is far from easy. In ESO, if you want to, you can master every profession. It’s going to take a ton of skill points and time, but you can definitely do it. 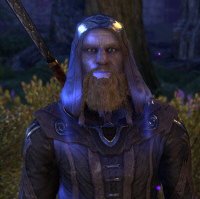 “Mastering” a profession in ESO is not just about reaching rank 50 with the relevant crafting skill line. Most players who spend some time in game and invest in crafting will get to rank 50 sooner or later, but fully mastering the profession takes more from you, depending on the profession you want to master, of course. Smith professions have it the hardest. Traits are properties which are applied on Armor and Weapons during the crafting process. These are specific to the Smith professions: Blacksmithing, Clothing and Woodworking. They can not be applied after the item has been crafted. You can learn new traits by researching them, and trait research is a serious time sink. You can research a trait off an item in your inventory which has that trait on it. This is the only way to learn traits. Before you can even think of researching anything, you have to get your hands on the exact item you want to be able to craft with the exact trait you want to learn. On top of this, traits are researched separately for every item type and slot. To give an example, you can research a trait for Heavy Armor Gloves. This does not make you learn to apply the same trait on Light Armor Gloves or Medium Armor Belt. You only learn the trait for the specific item & slot. Researching a trait for a specific item & slot DOUBLES the research time of the next trait for that item & slot. By default, you can only have ONE active research per profession. Even with the 20% research time reduction, the total time you’ll spend researching traits on a single item will be 51 days. 51 days doesn’t sound that long, does it? Perhaps it doesn’t, but I’d like to remind you there’s 14 different items in Blacksmithing and Clothing, 6 items in Woodworking that the 51 day research time applies to. And you can only ever have max 3 trait researches active per profession, one per item type & slot. The next thing we’ll look at are crafted item sets. Why do these require extreme dedication, you may ask? It’s directly tied to research. There are 19 different crafted item sets in game. Items sets give bonuses based on how many items you of the set you’re wearing. Sometimes there’s only a bonus for wearing three items of the set, sometimes you also get an extra bonus for wearing five set items. Torug’s Pact set, for example, adds 100 Armor when you use three set items, and reduces weapon enchantment’s internal cooldown by 1 second when you use five items. To craft an item set, you must first find the correct location for said item set. There’s special crafting stations scattered all across Tamriel which give different set bonuses. When you’ve found the correct crafting station, you are faced with the real problem: crafting set items requires you to have learned a number of Traits for the item type & slot you want to craft. The number changes based on the item set, and it’s anywhere between 2 and 8 traits. If you need five items of the set, and each of the item you want to craft requires you to have learned 8 traits for said item type, you must have gone through 51-day research for all five items. You can speed the process up a bit by mixing and matching items between the professions. Remember that you can have three researches active per profession if you have the passive skill. You could, for example, have a trait research going for two pieces of heavy armor (Blacksmithing), two pieces of light armor (Clothing) and a Bow (Woodworking) at the same time. Focusing your trait research on these same items would get you quicker to the point where you could craft the set pieces and get that juicy 5-set bonus. 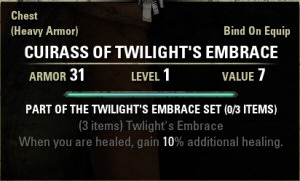 In a perfect world you’d be able to rock this specific 5-set bonus after 51 days, since the crafting requirement is eight traits. It is good to keep in mind that not every trait will be useful or desirable, nor will you be using every type of item in game. Chances are, though, that there is someone else out there who would want that specific trait for that specific item anyway. Finding someone who can craft a specific set item with the specific racial style, say Daedric, for example, will not be easy. Getting to the stage where you can craft every type of item in every racial style will take a long, long time. This is possibly the biggest single reason why crafted items are so powerful in ESO. Any weapon or piece of armor you find in Elder Scrolls Online can be improved by crafters. You can improve an item based on its quality. White items can be upgraded to green, green to blue, blue to purple, and finally, purple to gold. The highest item quality you’ll be able to get from dungeon bosses or in the world general is purple / epic. Gold / legendary items do not drop at all, but epic quality items can be improved to legendary quality by crafters. Improving a weapon boosts its damage, and improving Armor boosts its armor value. Needless to say, finding enough Legendary Tempers/Tannins/Resins to improve all of your items takes a lot of time. There’s three ways to gain crafting inspiration for the Smith professions: Creating items, Deconstructing items and reading skill books. Let’s take skill books out of the equation for now. Leapfrog Levelling System has to do with creating items on one character and deconstructing them on another to maximize the crafting experience / inspiration gain. I’ll explain how it works, but the bottom line here is that to level up Blacksmithing, Clothing and Woodworking fast, you need a friend. Technically you can do it with an alt as well, but in the end it would require you to play two characters instead of one, which is not optimal if you just want to level your smithing professions quickly. The reason you want to do this, is you gain a significantly larger amount of inspiration points / crafting experience from deconstructed items which are not made by you. It actually makes sense when you think about it – what would you learn by deconstructing the items you created? You already know how you crafted it. When you deconstruct someone else’s item, you can see how they have crafted the item, what kind of neat little tricks they have used, and thus gain more experience. This also applies to random world loot. Deconstructing looted items yields much more inspiration points than deconstructing your own items. You can of course think of this type of system as a positive thing from a crafter’s point of view, and it probably is. It does, however, require that extra person you can work with and trust. Finding an equally beneficial leapfrog buddy for crafting may not be easy for everyone, and the system definitely promotes cooperation with fellow crafters in game, and dedication to following the system.